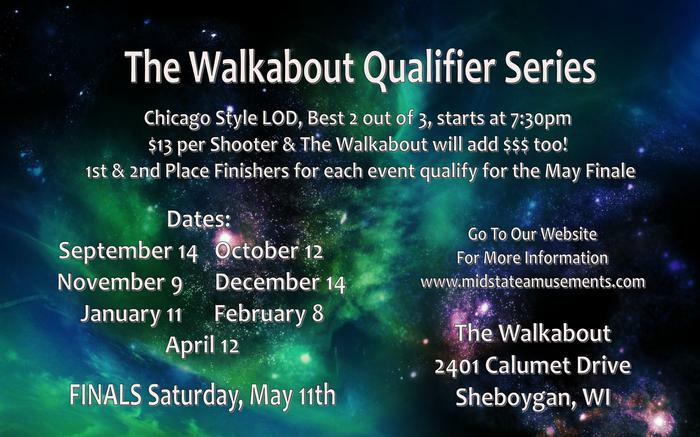 Bulldog Darting Presents the Walkabout Qualifier Series! 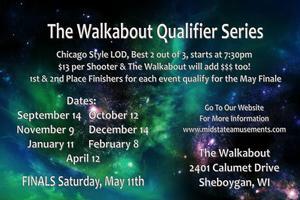 NEW THIS YEAR: All the Qualifier events will be shot on Friday nights at 7:30pm. The top 2 teams will automatically qualify for the finals. This year's format will be Chicago Style LOD, best 2 out of 3. The winners bracket will play 501, cricket, and 701 stacked. The losers bracket will play 301, cricket, and 501. The freeze rule will be in effect. Qualification Requirements: There will be 32 spots open for the finals. If you take 1st or 2nd in any of the events, you automatically qualify for the finals. If there are not 32 spots filled, the remaining spots will be filled based on points. The top 3 in points will receive $$$ and the highest women in points will also receive $$$. You will receive 10 points each time you register plus additional points based on how you place. It will be $13 per event with money added from The Walkabout.